The white flowering Kunzea ambigua is a large evergreen shrub to around 3m in height, with masses of white flowers from spring through summer. 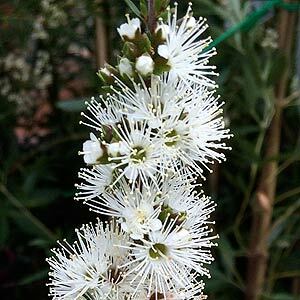 Related to Callistemon and with similar flowers this species is also known as the ‘Tick Bush’ and ‘Poverty Bush’. Some lower growing cultivars are available that will reach around 2m and with a little pruning stay even smaller. A prostrate form that reaches around 30 – 50 cm is also available. As a landscaping plant this is tough character that require little attention once established. The lower growing forms are good open ground cover plant , and all work well in rock gardens or the native border. Kunzea ambigua is also used to produce essential oils which are distilled from the new growth. S0 why ‘Tick Bush’ /It is the oils released from the plants that are said to repel ticks. Kunzea ambigua prefers a well drained soil and full sun. New plants should receive a little extra water and some protection from full sun through the first summer, drought tolerant once established Propagation is best from semi hardwood cuttings. Tip prune after flowering to promote a more bushy and compact habit.